52.00" T2T at 25 months with 9" broken off. She was 32.00" T2T on her first birthday. Her sire, Rim Rock is now over 84.00" T2T and her dam WF Dumpling is one of the prettiest and biggest horned grulla cows in the breed. 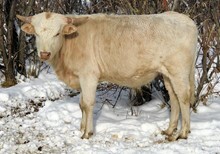 Dumpling is also the dam of Mr Chex, who is only the 2nd bull in the breed to be over 75" T2T and 19.50" base. Mr. Chex was 75.75" T2T and 19.50" base on 03-27-14, his 3rd birthday. Dimple Doll also has 2 full sisters that we just love, PCC Dazzle Doll (2014) and PCC Dashing Doll (2015). We will breed her to our Fifty Fifty son, 50 Amp.